Toyota's new safety package will be available in the U.S. first in the RAV4 hybrid and Lexus RX. TOKYO/DETROIT -- Toyota is trying to jump ahead rivals by offering a suite of advanced safety features at unusually affordable prices. The automaker said today it will begin offering automatic braking, lane departure alert technology and other safety electronics later this year in a package priced at about $300 in its compact cars. A slightly more advanced version will be priced at about $500 for midsize and larger models. The Lexus brand will have the most advanced suite of technologies, with prices from about $500 to $635, the automaker said. Toyota has promised to deploy the systems in most light vehicles and trim levels in Japan, the U.S. and Europe by 2017. 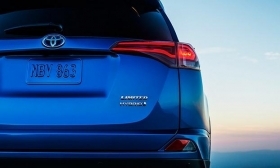 In the U.S., the packages will be available first in the RAV4 hybrid and the Lexus RX that will be unveiled this week at the New York auto show, and rolled out to other models throughout the year. In Toyota's small cars, an optional collision avoidance system uses a camera and laser radar to detect objects ahead of the vehicle and prompts the driver to brake if a crash is likely, and boosts braking power if the driver reacts. If the driver fails to respond, the system brakes automatically to prevent or mitigate any collision. The small-car system also includes lane-departure technology and a system that automatically switches between high and low beam headlights. The small car package is called Toyota Safety Sense C.
In larger cars, the Toyota Safety Sense P package includes the same features but uses more advanced technology combining a camera and millimeter-wave radar, and is able to identify pedestrians in the roadway. The large-car package also includes dynamic cruise control, which is capable of slowing the vehicle automatically to maintain a safe following distance on highways, and avoid collisions with merging vehicles. The Lexus safety options are slightly more refined and can, for example, warn drivers of dangers through steering-wheel vibrations in addition to audio and visual signals. The safety announcement represents the latest move by automakers to offer advanced safety technologies at affordable prices in mainstream vehicles. Just a few years ago, systems such as active cruise control and automatic braking were found almost exclusively in upscale cars as options costing upwards of $1,500. Satoshi Ogiso, managing officer for product planning, said the safety systems will start to arrive stateside this year. Generally speaking, the U.S. will see an initially wider deployment of the high-end TSSP system because bigger vehicles are in heavier demand there, he said. Toyota is introducing the technologies in a push to burnish its safety credentials as automakers seek to differentiate themselves from rivals. The systems are also basic building-block technologies that will underpin future autonomous cars. In Japan, the TSSC system is optioned as part of a 50,000-yen ($420) package on the upgraded Corolla going on sale Wednesday. The package includes other functions such as traffic jam assist. TSSC, the system for small vehicles, can automatically stop a car traveling at 30 km/hour (19 mph) before impact, and it operates up to 50 mph. So at 50 mph, it can slow a car by 19 mph, dropping the speed at impact to 31 mph and thereby softening a crash. Continental AG supplies this system. TSSP, the pre-crash system for bigger vehicles, can stop a car going 25 mph before impact with another vehicle, or trim 25 mph off higher speeds before a crash. Unlike TSSC, it can detect also pedestrians and prevent the vehicle from striking them at speeds up to 19 mph. This technology is supplied by Denso Corp.